Tully Variety Management group on the many new varieties now available to Tully growers. This work has been discussed before and is really a simple process of gathering data on how new varieties germinate, their CCS curve, trends over a set time span and how they grow in the field. 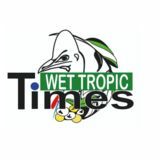 Since 2012 there have been 16 new varieties released by SRA for the Wet Tropics region. This is basically double the number that was released a decade before and as advances are made in plant breeding, so too comes the challenge of obtaining lcoal knowledge quickly so that growers can make better decisions for planting. 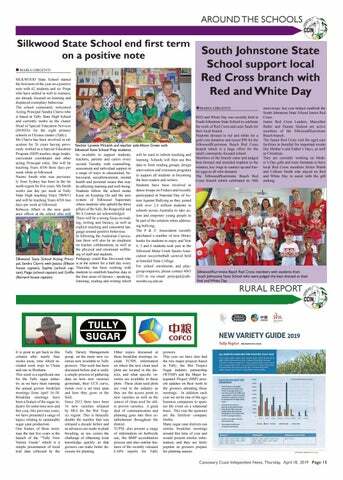 anniversary last year helped establish the South Johnstone State School Junior Red Cross. Junior Red Cross Leaders, Maryellen Butler and Dianne Dodson are active members of the Silkwood/Kurrimine Beach branch. The Junior Red Cross visit the aged care facilities in Innisfail for important events like Mother’s and Father’s Days, as well as Christmas. They are currently working on Mother’s Day gifts and were fortunate to have local Red Cross members Helen Walsh and Colleen Smith who stayed on Red and White Day to assist with the gift making. Silkwood/Kurrimine Beach Red Cross members with students from South Johnstone State School who were judged the best dressed at their Red and White Day. growers. This year we have also had the two major projects based in Tully; the Wet Tropics Sugar industry partnership (WTSIP) and the Major Integrated Project (MIP) present updates on their work to the growers attending these meetings. In addition each year we invite one of the agri business companies to sponsor the event on a rotational basis. This year the sponsors are the fertilizer company Stoller. Many sugar cane districts run similar breakfast meetings around this time of year and would present similar information, and they are fairly popular as growers prepare for planting season.